And to think there were some who thought that once slam door stock was withdrawn fleets would be unchanging and things would look rather samey! How wrong could anyone be regarding TOCs in the former Southern Region area? As if any evidence is needed, the above remarkable shot taken at Selhurst at 12:47 on Thursday 5th March shows in a single glance three out of four flavours of Govia. 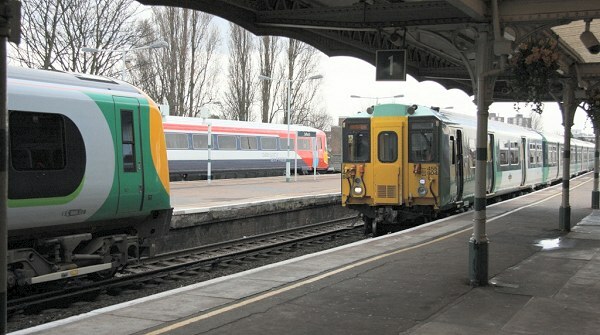 Class 350 350114 is on a driver training run in connection with running the East Croydon to Milton Keynes service later in March, Gatwick Express Class 442 442417 is on a Victoria to Gatwick Airport working and Class 455/8 455804 on a down suburban service. Only the absence of a Trains unit prevents this from being the perfect photographic coup.